Inversion therapy is a simple but effective treatment that provides wonderful relief from bodily aches and tension. Back and joint pain is often a result of excess compression in your spinal column and load-bearing joints; this will make you feel stiff, achy and uncomfortable and can cause permanent damage as it builds up over time. 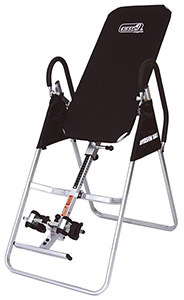 Inversion tables are used by chiropractors and physiotherapists to relieve this compression and can also be easily used at home to treat yourself. The Sissel Hang Up Inversion Table is ideal for this as it has been expertly designed and constructed with the utmost quality, while being affordable and simple to use even without training. What is inversion therapy and how can it help? Inversion therapy stretches the back by reversing the force of gravity that is usually pressing your joints and spine together. This relieves any compression that could be cauing you pain, allowing your spine and joints to relax and recover. As this therapy uses your body weight, it is automatically customised to what your body can handle, making it ideal as a gentle but effective rehab therapy. The Sissel Hang Up is constructed from robust but lightweight materials; it can support up to 110kg (17 stone 3lb) of weight but is easily folded away flat for compact storage when not in use. The comfortably padded ankle supports can be adjusted for your height (from 1.4 metres to 2 metres/4ft 7” to 6ft 6”) and will keep you in the correct position as you are inverted. Padded handles help you to adjust the level of inversion yourself and give you something to hold onto during your treatment.